In French, snails are called escargot, limaçon or limace. 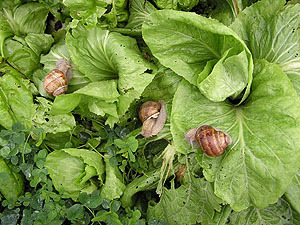 Whereas "escargot" usually means a snail, especially an edible one, limaçon means an inedible snail and limace a slug. Different snail species are traded as escargots. Basically many of them belong among the family of Helicid snails (Helicidae) and among those especially to the Roman snail's relatives (Helix and related genera). On the other hand also the Achatinidae family of giant African land snails is important as edible snails. In Europe and North America, the main part of edible snails consists of Helicid snails. Achatinid snails, in contrary, are mainly consumed on the African continent. Piecemeal or in conserves, they may also be found in the European and American cultural area. Eobania vermiculata. Picture: © V. Wiese. Among edible Helicid snails, there are, on the other hand, also species like the noodle snail (Eobania vermiculata), which, in contrary to Roman snails, are not cultivated in snail farms, but collected from nature. This snail's scientific name also has got an interesting culinary history: It goes back to the Danish malacologist Otto Friedrich Müller (see also "The Cornu Problem"), who first described the species and thus earned the right to name it. The species' shell pattern reminded him of Italian Vermicelli noodles, which is why he named the species vermiculata – noodle snail. That is the reason why, until today, the complete scientific name of this species is Eobania vermiculata O.F. Müller 1774. Relatives of the Roman Snail. The larger kinds of Helicid escargots are generally from three types: Escargot de Bourgogne, Escargot Petit Gris and Escargot Turc. Escargot de Bourgogne, meaning Burgundy snail, is the Roman snail (Helix pomatia), a name, which also point to the culinary consummation of snails by the Romans, and their subsequent distribution throughout the Roman Empire. In contrary to that, Petit Gris (Little grey snail) means the brown garden snail (Cornu aspersum, also often mentioned under the obsolete name Helix aspersa). Escargot Turc (Turkish snail) finally describes Helix lucorum, usually imported from Asia Minor, hence the name. Aside from wild type forms of snails, there are, like among other farm animals, also numerous domesticated forms, which, in the case of snails, have mainly been bred for weight. 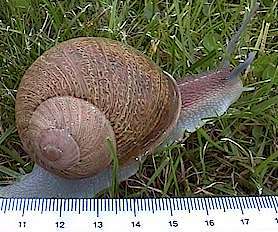 So against a normal wild type Petit Gris (Cornu aspersum) of an average weight of 10 g, domesticated giant forms, like the Gros Gris (large grey snail) from North Africa, reach weight of up to 20 g. In the meantime there are domesticated races, such as the Gros Gris "Blond des Flandres". 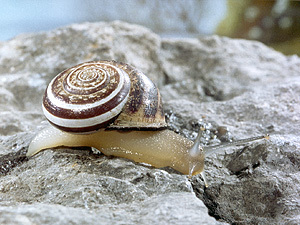 The snail displayed in the picture to the right, measures at least 8 cm (3 inches) foot length. So it outgrows many of the Helix pomatia, usually noticeably larger than Cornu aspersum. 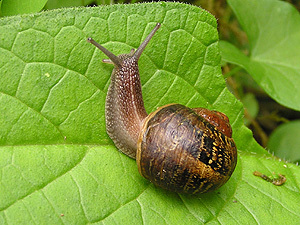 There is another consequence of snail domestication: Whereas the characteristic shell pattern of a wild type Petit Gris in nature hides it efficiently from its enemies, the shells of domesticated snails usually are unicoloured and very light brown, a colour, which in nature would not let them survive for very long. Parallels to wild boar and domesticated pig catch the eye. Patterns of banded snails: Camouflage by polymorphism.